To describe MRI features of accessory cavitated uterine mass (ACUM) with surgical correlations. Eleven young women with an ACUM at pathology underwent preoperative pelvic MRI. 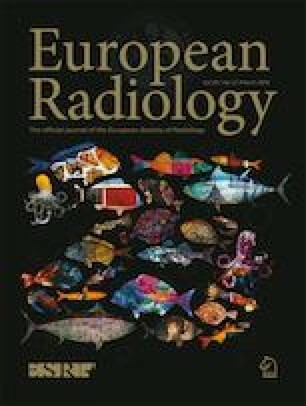 Two experienced radiologists retrospectively analysed MR images in consensus to determine the lesion location within the uterus, its size, morphology (shape and boundaries), and structure reporting the signal and enhancement of its different parts compared to myometrium. The presence of an associated urogenital malformation or other gynaecological anomaly was reported. MRI features were correlated with surgical findings. All 11 lesions were well correlated with surgical findings, lateralised (seven were left-sided), and located under the horn and the round ligament insertion. Nine were located within the external myometrium, bulging into the broad ligament. Two were extrauterine, entirely located within the broad ligament. On MRI, the mean size was 28 mm (range 17–60 mm). Nine lesions were round-shaped, two were oval; all had regular boundaries. At surgery, the ACUM were not encapsulated but were possible to enucleate. On MRI, all lesions were well defined and showed a central haemorrhagic cavity surrounded by a regular ring (mean thickness, 5 mm) which had the same signal compared to the junctional zone. ACUM was isolated in all women, without urogenital malformation, adenomyosis or deep endometriosis. On MRI, ACUM was an isolated round accessory cavitated functional non-communicating horn-like aspect in an otherwise normal uterus. MRI may facilitate timely diagnosis and appropriate curative fertility-sparing laparoscopic resection. • ACUM is rare, with delayed diagnosis in young women with severe dysmenorrhoea. Pelvic MRI facilitates timely diagnosis and appropriate curative fertility-sparing laparoscopic resection. • Quasi-systematically located under the uterine round ligament insertion, ACUM may be intramyometrial and/or in the broad ligament. • On MRI ACUM resemble a non-communicating functional accessory horn within a normal uterus; the mass, most often round-shaped, had a central haemorrhagic cavity surrounded by a regular ring which had the same low signal compared to the uterine junctional zone. The online version of this article ( https://doi.org/10.1007/s00330-018-5686-6) contains supplementary material, which is available to authorized users. The authors would like to thank Philip Robinson (DRCI, Hospices Civils de Lyon) for help in manuscript preparation. The scientific guarantor of this publication is Professor Pascal Rousset, Lyon, France.